Teradek Bolt 500 XT SDI/HDMI Deluxe Kit includes one transmitter and one receiver with installed V-mount, plus a variety of accessories. Teradek Bolt 500 XT SDI/HDMI transmitter receiver kit enables you to immediately start transmitting up to 1080p60 video from either an SDI source. The zero latency transmitter/receiver pair features a 500′ line-of-site transmission distance when used together. You can send and receive visually lossless 3G-video signals from a Bolt 500 transmitter with zero latency. The Teradek transmitter features a loop out SDI connector so you can feed your on camera monitor. The Teradek receiver has a factory installed V-mount battery plate and features an SDI output. Teradek transmitter receiver set supports digital SD and HD signals. The inputs and outputs support a variety of HD signals in both 50 and 60 Hz standards, as well as 480i and 576i. You can transmit to a total of four receivers, including other Bolt 500 XT, LT, Sidekick II and 703 Bolt receivers. The built-in AES 128-bit encryption helps to keep your transmitted video safe from prying eyes. Accessory arm and NATO mounts provide mounting options for Teradek transmitter receiver set. 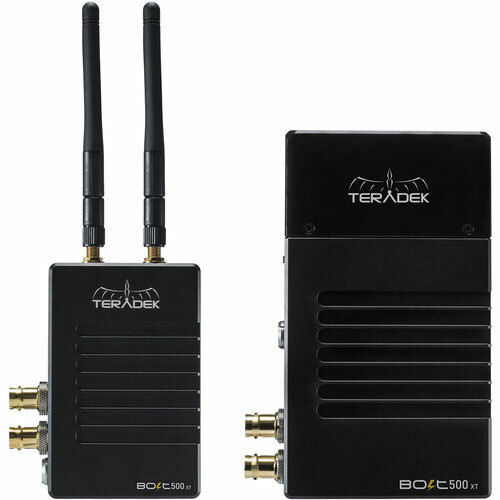 Teradek Bolt 500 XT SDI/HDMI Wireless transmitter receiver set is available for rent or hire from RENTaCAM Sydney.